If you have been injured by a transportation accident involving an automobile, truck, bus, taxi cab, airplane or train, you may be entitled to compensation for medical bills, vehicle repairs, pain and suffering, loss of earning, and future loss of earnings. In the event that a death has occurred, you can file a wrongful death suit. 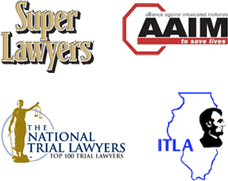 Our Illinois and Chicago personal injury lawyers are prepared to help you with the legal matters following an accident. The personal injury and wrongful death lawyers at Nemeroff Law Offices represent many victims who are injured or killed by the negligence of others. We will help you recover the money damages you or your family is entitled to. There are many types of car accident which give rise to the need to hire a Chicago injury lawyer. Our site has information about many of them. Please click on the following areas to learn more. If you or someone you love have sustained injuries or loss from an ATV accident Contact Nemeroff Law Offices today. Our experienced car accident attorneys are available to speak with you directly.